Recycle cereal/product boxes or chipboard from paper pads, or use poster board cut to desired size if you want to go fresh and new. Cut (scissors or paper cutter) to desired size. Punch holes (two or three depending on your size). This book is easy to add (or remove) additional pages too and reorder the pages also. Please note that the book base may not be acid free and could effect the future of your book. Punch holes first so that your page art can be placed around the holes rather than over them. To punch holes, use one page as a template then place over the next page and draw the circle and punch the next page, continue till you have the desired amount of pages. Make sure your binder rings can hold the size and weight of the pages and that your pages can turn easily. Add tabs to the page top or right side edge. Add recycled envelopes to hold items like tickets, notes, pictures. 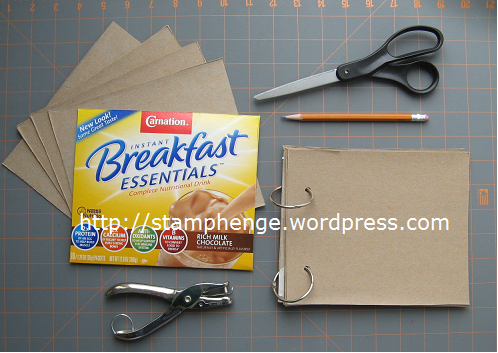 Put tags or other type of minibooks in the envelopes with journaling. Use the sides of the box to add flaps in the book, make sure you tape them down first then cover them up. Add accordion folds to a page to expand and add more pictures or journaling. Add stickers or scrapbook embellishments to make your journal fun and funky. Add hole reninforcers if desired. Create a travel book and use a map of the area as page backgrounds. Use as an experimental technique book for art ideas or product use, or inventory pages.